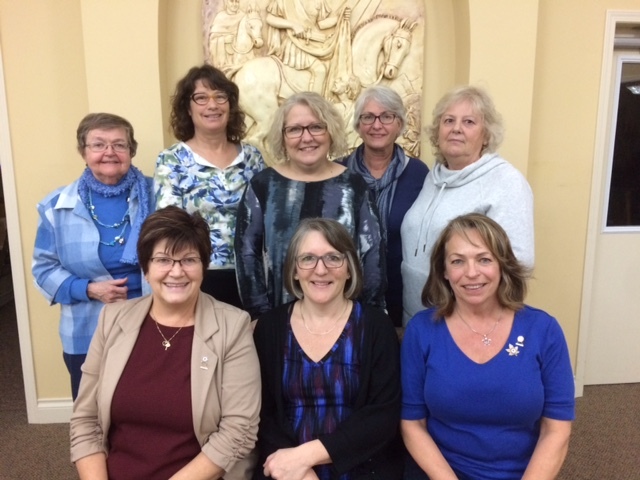 Back Row: Dorothy Taylor, Community Life; Marylou Ellan, Secretary; Lori Martine, Organization President Elect; Trish Craik, Treasurer; Vicky White, Spiritual. Front Row: Linda Nunes, President; Tracy Veintimilla, Health and Education; Claire Schwartzenberger, Past President & Communication. Our council has been in existence since 1945 when a small group of young women united to offer mutual support and involve themselves in the issues affecting their families, church, and community. We are proud to claim that some of those charter members are now celebrating over 60 years of membership in our council ! Our local council currently boasts over 80 members continung to work for "God and Canada". Nationally, we stand with over 99,000 other CWL members when addressing such important issues as euthanasia and assisted suicide, trafficking of children, protection of water resources, elder abuse, and more.